Louisa May Alcott (November 29, 1832 – March 6, 1888) was an American novelist. She is best known for the novel "Little Women", published in 1868. This novel is loosely based on her childhood experiences with her three sisters. Alcott was a daughter of noted Transcendentalist Amos Bronson Alcott and Abigail May Alcott. Louisa's father started the Temple School; her uncle, Samuel Joseph May, was a noted abolitionist. Though of New England parentage and residence, she was born in Germantown, which is currently part of Philadelphia, Pennsylvania. She had three sisters: one elder (Anna Alcott Pratt) and two younger (Elizabeth Sewall Alcott and Abigail May Alcott Nieriker). The family moved to Boston in 1834 or 1835, [, "New York Times", March 7, 1888. The obituary indicates that the family moved to Boston when Alcott was 2 years old, therefore in 1834-5. This is supported by the United States Census, 1850 which records that her younger sister, Elizabeth, was born in Massachusetts and was aged 15 (therefore born around 1835) at the time of the census.] where her father established an experimental school and joined the Transcendental Club with Ralph Waldo Emerson and Henry David Thoreau. During her childhood and early adulthood, she shared her family's poverty and Transcendentalist ideals. In 1840, after several setbacks with the school, her family moved to a cottage on two acres along the Sudbury River in Concord, Massachusetts. The Alcott family moved to the Utopian Fruitlands community for a brief interval in 1843-1844 and then, after its collapse, to rented rooms and finally to a house in Concord purchased with her mother's inheritance and help from Emerson. Alcott's early education had included lessons from the naturalist Henry David Thoreau but had chiefly been in the hands of her father. She also received some instruction from writers and educators such as Ralph Waldo Emerson, Nathaniel Hawthorne, and Margaret Fuller, who were all family friends. She later described these early years in a newspaper sketch entitled "Transcendental Wild Oats," afterwards reprinted in the volume "Silver Pitchers" (1876), which relates the experiences of her family during their experiment in "plain living and high thinking" at Fruitlands. As she grew older, she became both an abolitionist and a feminist. In 1847, the family housed a fugitive slave for one week. In 1848 Alcott read and admired the "Declaration of Sentiments" published by the Seneca Falls Convention on women's rights. Due to the family's poverty, she began work at an early age as an occasional teacher, seamstress, governess, domestic helper, and writer &mdash; her first book was "Flower Fables" (1855), tales originally written for Ellen Emerson, daughter of Ralph Waldo Emerson. In 1860, Alcott began writing for the "Atlantic Monthly". She was nurse in the Union Hospital at Georgetown, D.C., for six weeks in 1862-1863. Her letters home, revised and published in the "Commonwealth" and collected as "Hospital Sketches" (1863, republished with additions in 1869), garnered her first critical recognition for her observations and humor. Her novel "Moods" (1864), based on her own experience, was also promising. Lesser-known parts of her work are the passionate, fiery novels and stories she wrote, usually under the pseudonym A. M. Barnard. These works, such as "A Long Fatal Love Chase" and "Pauline's Passion and Punishment", were known in the Victorian Era as "potboilers" or "blood-and-thunder tales." Her character Jo in "Little Women" publishes several such stories but ultimately rejects them after being told that "good young girls should [not] see such things." Their protagonists are willful and relentless in their pursuit of their own aims, which often include revenge on those who have humiliated or thwarted them. These works achieved immediate commercial success and remain highly readable today. Alcott also produced moralistic and wholesome stories for children, and, with the exceptions of the semi-autobiographical tale "Work" (1873), and the anonymous novelette "A Modern Mephistopheles" (1875), which attracted suspicion that it was written by Julian Hawthorne, she did not return to creating works for adults. Louisa May Alcott's overwhelming success dated from the appearance of the first part of "Little Women: or Meg, Jo, Beth and Amy", (1868) a semi-autobiographical account of her childhood years with her sisters in Concord, Massachusetts. Part two, or "Part Second", also known as "Good Wives," (1869) followed the March sisters into adulthood and their respective marriages. "Little Men" (1871) detailed Jo's life at the Plumfield School that she founded with her husband Professor Bhaer at the conclusion of Part Two of "Little Women." "Jo's Boys" (1886) completed the "March Family Saga." Most of her later volumes, "An Old-Fashioned Girl" (1870), "Aunt Jo's Scrap Bag" (6 vols., 1871&ndash;1879), "Eight Cousins" and its sequel "Rose in Bloom" (1876), and others, followed in the line of "Little Women", remaining popular with her large and loyal public. In her later life, Alcott became an advocate of women's suffrage and was the first woman to register to vote in Concord, Massachusetts in a school board election. to address women’s issues in a modern and candid manner. Their works were, as one newspaper columnist of the period commented, "among the decided 'signs of the times'" (“Review 2 – No Title” from "The Radical", May 1868, see References below). The story of her life and career was initially told in Ednah D. Cheney's "Louisa May Alcott: Her Life, Letters and Journals" (Boston, 1889) and then in Madeleine B. Stern's seminal biography "Louisa May Alcott" (University of Oklahoma Press, 1950). * "Little Women, Little Men, Jo's Boys" (Elaine Showalter, ed.) (Library of America, 2005) ISBN 978-1-93108273-0. * Orchard House, where Alcott lived when writing "Little Women"
* Walpole, New Hampshire, where the abundant lilacs in the town inspired Alcott to write the book "Under the Lilacs"
* Shealy, Daniel, Editor. "Alcott in Her Own Time: A Biographical Chronicle of Her Life, Drawn from Recollections, Interviews, and Memoirs by Family, Friends and Associates." University of Iowa Press, Iowa City, Iowa, 2005. ISBN 0-87745-938-X. *“Review 2 – No Title” from The Radical (1865 - 1872). May 1868. American Periodical Series 1740 - 1900. [http://proquest.umi.com/pqdweb?RQT=305&querySyntax=PQ&searchInterface=1&moreOptState=OPEN&TS=1170259771&h_pubtitle=&h_pmid=&clientId=2281&JSEnabled=1&SQ=Anne+Moncure+Crane&DBId=5197&onDate=&beforeDate=&fromDate=&toDate=&pubtitle=&author=&AT=any&STYPE=all&FT=1&sortby=CHRON&searchButtonImage.x=0&searchButtonImage.y=0] (link is password only) (29 January 2007). * [http://litmed.med.nyu.edu/Annotation?action=view&annid=289 Annotation of Hospital Sketches] at NYU Literature, Arts, and Medicine Database, with link to the e-text. 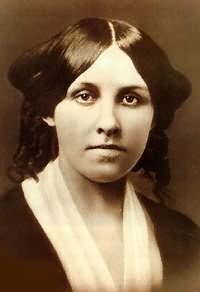 * [http://www.personal.psu.edu/shp2/LouisaMayAlcottSociety/LMAS_welcome.htm The Louisa May Alcott Society] A scholarly organization devoted to her life and works. * [http://www.alcottfilm.com/ Louisa May Alcott, the real woman who wrote Little Women] . A web site about Louisa May Alcott which will be the foundation for a documentary film, published media and educational programs.